As the purpose of this booklet is to encourage ongoing tuna sales, it is suggested to cut on the dotted lines to keep the recipes in your recipe box. 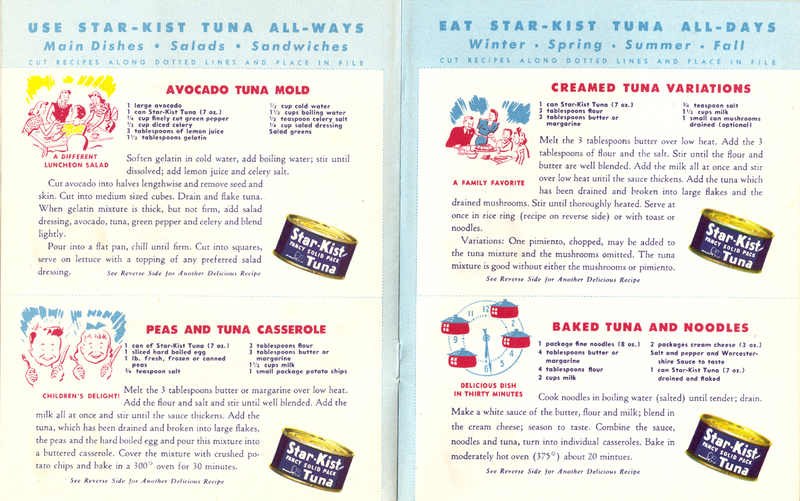 These recipes provide a wonderful “slice of life” view into the mid-20th century tuna-user lifestyle. Molds, Casseroles and anything creamed dishes are rarely-seen on the table of today. And one could take issue with the idea that the Peas and Tuna Casserole fosters “Children’s Delight.” But then again, quite a bit has changed in the last 50 years. Things were different before video games. Recipes: Avocado Tuna Mold, Peas and Tuna Casserole, Creamed Tuna Variations and Baked Tuna and Noodles.